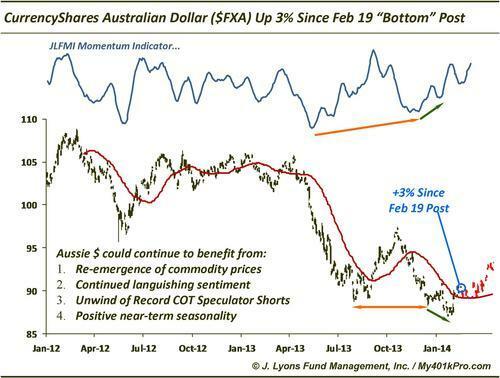 On February 19, our Chart of the Day was the potential bottom in the CurrencyShares Australian Dollar ($FXA). Since then, FXA is up 3% and hit 93 for the first time since November. This still has potential to run a long way further based on the positives listed in the chart. If you missed this one, check out our ChOTD today on the Canadian Dollar $FXC…echoes of the 2/19 $FXA setup there presently.